With the Australian Labour Party electing yet another leader this week (they’re a fickle bunch), it would appear that the powers that be are still trying to get the measure of public opinion Down Under. But perhaps they could learn a thing or two from the South Korean city of Seoul. 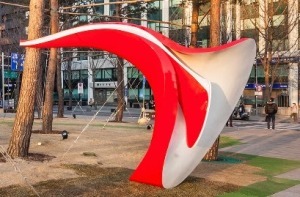 In an effort to encourage communication between the elected and the electorate, Seoul City Council has installed Yobosayo, a giant ear, outside City Hall. …which are transmitted by microphones inside the ear and broadcast through loudspeakers inside City Hall for all and sundry to hear. Yobosayo means hello? in Korean and it rather tickled my fancy to think that as each person leant into the ‘trumpet’, they would utter this self-conscious salutation before embarking on their particular litany. Think about how often this is our ‘greeting’: to the unknown caller, a potentially unoccupied room and even an obscure fact. Anyway it rather amused me to think of all of those important councillors being ear-bashed by hundreds of hellos each day. And speaking of hellos, there’s a rather big hello in the offing here with only two sleeps to go until Lil Chicky gets her big gidday hug in the Arrivals Hall at Heathrow Airport from yours truly. This entry was posted in Inspired by, Lil Chicky and tagged Lil Chicky, sleeps to go, Springwise.com, Yobosayo by Kym Hamer. Bookmark the permalink.